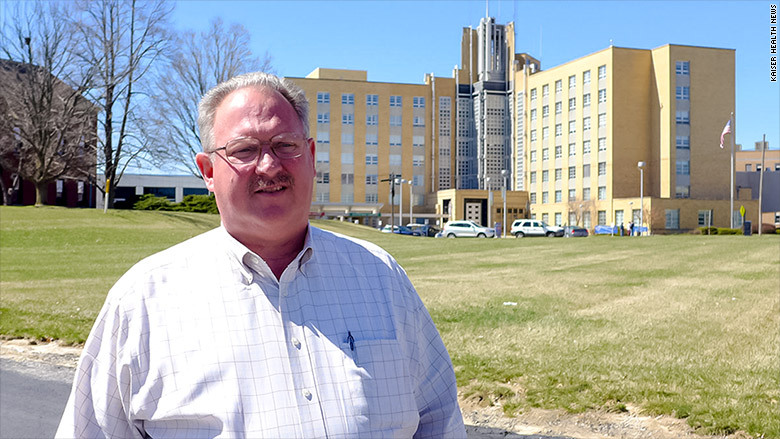 Belleville Mayor Mark Eckert stands outside St. Elizabeth's Hospital, which is looking to move to wealthier digs. St. Elizabeth's Hospital has been a downtown bedrock of Belleville, Illinois, since 1875. The Catholic hospital is so tied to this southern Illinois city that when the local economy slumped in 2009, the non-profit St. Elizabeth's gave $20 to every employee to spend on Main Street, sending hundreds of shoppers out to the mostly mom and pop-owned stores. But "St. E's," as locals call it, now faces its own financial troubles, largely a result of the costs of maintaining an obsolete facility and of growing numbers of low-income and uninsured patients from Belleville and neighboring East St. Louis, one of the poorest cities in the Midwest. Like a small but growing number of hospitals around the country, St. Elizabeth's is taking a radical step. Hospital officials plan to close the 303-bed hospital and are seeking state approval to build a $300-million facility seven miles northeast, in O'Fallon. It's a wealthier city that is one of the fastest-growing communities in the St. Louis region with new subdivisions, proximity to a regional mall, and quick access to Interstate 64. Hospitals have followed population migrations before, but relocations like St. Elizabeth's are becoming more common. That's partly due to the aging of many facilities built decades ago, as well as the desire to attract better-paying patients. -- Just west of Fort Lauderdale, HCA Inc (HCA)., a for-profit hospital chain, plans to close Plantation General Hospital and open a new hospital seven miles away in more affluent Davie, near a medical school. -- Tennova Healthcare is moving its flagship Physicians Regional Medical Center near downtown Knoxville, Tennessee, closer to higher-income suburbs eight miles west. That will leave just one general hospital downtown. Tennova is owned by Community Health Systems (CYH), a for-profit hospital system. -- Just outside Cleveland, Lakewood Hospital in Lakewood, Ohio, which is managed by the Cleveland Clinic, is slated to close in 2016. Patients will be directed to the Clinic's newer Fairview Hospital three miles away or to another facility being built in Avon, 13 miles away. Both Fairview and Avon are higher-income towns. Hospital officials often say it is cheaper to build, rather than renovate, their mostly downtown facilities. What they don't say publicly is how geography often determines a hospital's economic destiny, especially at a time of increasing financial pressure as a result of Medicare funding cuts, including penalties that may result from new pay-for-performance measures in the Affordable Care Act. By moving to wealthier areas, hospitals can reduce the share of uninsured and lower-paying Medicaid patients, while increasing the privately insured. That's also why they locate outpatient centers and medical offices in affluent suburbs. But relocations often spark anger from those left behind, who worry about the loss of jobs and of access to care. "Hospitals were established in inner cities where the greatest needs were and now, essentially, that charity obligation has gone by the wayside as they are looking at their bottom line," said Gerard Anderson, director of the Center for Hospital Finance and Management at the Johns Hopkins Bloomberg School of Public Health. "Communities can be tipped by the loss of a vital medical institution," Belleville Police Captain John Moody II wrote in a scathing letter about St. Elizabeth's plan to a state review board. "There is too much at stake and the loss will be catastrophic and I fear unrecoverable." Belleville Mayor Mark Eckert, who was born at St. Elizabeth's, drove an ambulance when he was a teenager and now lives three blocks away, said he fears the move will devastate downtown, make it more difficult for some people to get care, especially those dependent on public transportation, and lead to overcrowding at the city's one other hospital, which is downsizing. St. Elizabeth's officials deny that, noting that only a quarter of their patients come from Belleville, and the new site will be closer to the majority who live in other communities, including eight of the 10 poorest zip codes in their service area. "Being more centrally located will also make care more accessible for everyone, regardless of income," the hospital said in a statement. Most of St. Elizabeth's operates out of a 60-year-old building that they say is difficult for many people to get to because of one-way roads. In addition, patient rooms are too small and the emergency room is cramped. None of those arguments have swayed Rev. Monsignor John Myler, rector of St. Peter's Cathedral, across from the hospital. "It is contrary to Francis to ask those in need to travel to him," he wrote in opposition. "Rather Franciscans are — and have been for centuries — right among the people, not in a well-to-do place asking the people instead to come to them." A state commission is expected to vote on the proposed move on April 21.